The holidays are a busy time. Guests are coming and going on an almost daily basis and the little ones are starving for holiday snacks. 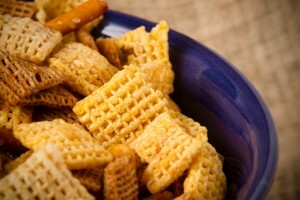 A family favorite has always been Chex mix. This simple treat is super easy to make and can be a healthier alternative to endless candy canes and cookies. If you’re looking for the perfect snack to please the whole family, try one of these tasty Chex mix recipes. You’ll not only be known as chef of the year, but also save a few bucks in the process. Put white chocolate chips in a microwave-safe bowl and microwave until melted (cook in 20 second intervals until chocolate is smooth, stirring between each zap). Place Rice Chex in a large bowl and pour the melted chocolate chips over the Chex. Add coconut, cherries, pecans, and candies. Toss until all the ingredients are well-coated in chocolate. Pour mixture onto parchment paper and spread it out flat. Allow mixture to cool for 5 minutes and then break it apart and enjoy! Put cereal in a large bowl. In a medium, microwave-safe bowl, mix together brown sugar, butter, corn syrup, food coloring and cake mix. Microwave on high, uncovered for 2 to 2 1/2 minutes or until the mixture is boiling. Immediately pour over cereal and toss until Chex is well covered. Spread mixture in a thin layer over parchment paper and let cool for five minutes. In a small, microwave-safe bowl, place the frosting. Microwave uncovered for 20 seconds. Drizzle the frosting over Chex mix as it cools. Break apart and enjoy! Preheat the oven to 300 degrees. Line two large baking sheets with parchment paper. In a mixing bowl, whisk together sugars, cinnamon, salt and cayenne until they’re evenly combined and set the bowl aside. In a second large mixing bowl, combine Chex cereal, pecans and pretzels. Add in the egg whites and toss until the mixture is evenly coated. Add the sugar mixture to the large bowl and continue tossing until the mixture is well combined. Spread the mixture out evenly onto the baking sheets and bake for 20 minutes. Then, remove from the oven and turn over the mixture to make sure it cooks evenly. Break up large chunks if needed. Bake again for another 20 to 25 minutes or until the mixture is crisp (it will continue to crisp as it cools). Cool for 10 minutes. Break up the creation if needed and serve! This holiday season, don’t stress about snacks. These easy Chex mix recipes are sure to be your family’s new favorite treat!